Is there another way to tunnel? There was an intriguing discussion on Thursday in the Construction Committee of the Metro Board of Directors involving different tunneling methods that could be used on the Westside Subway Extension and other Metro projects that may require tunneling such as the Downtown Regional Connector, the Crenshaw Line and a 710 tunnel (if that project comes to pass). The gist of it surrounded this question: is there another way to dig tunnels and build rail stations that may be faster and less disruptive than the current method used by Metro? It’s important to understand it was just a conversation. No decisions were made and it’s clear a lot more information is needed before any decisions will be made. 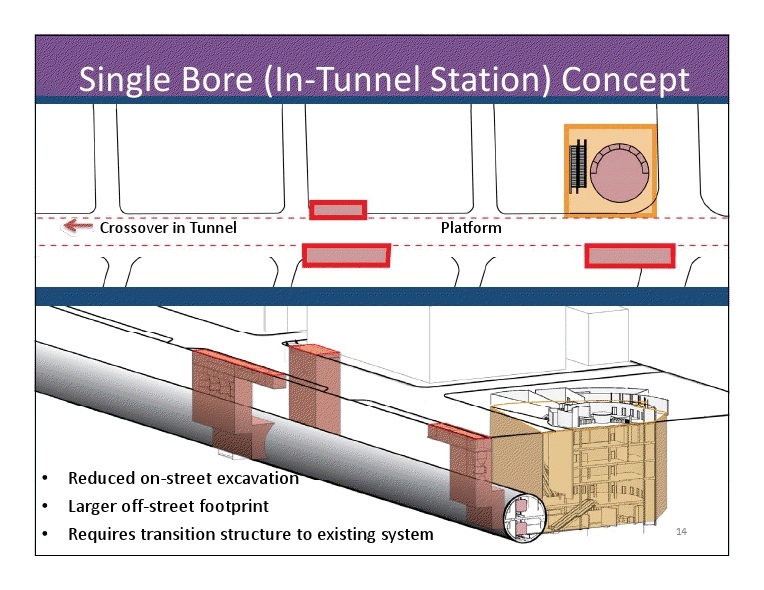 In the last two rail tunnels built by Metro — on both the Gold Line Eastside Extension and the existing Red and Purple line subway — the twin-bore method was used. To put it another way, two side-by-side tunnels were dug — one for each set of rails — and stations were excavated from the surface. The work went particularly well on the Gold Line and third phase of the Red Line between Hollywood and NoHo. In recent years, even larger tunneling machines have come into existence. They’re called single-bore machines and as the name implies, they’re capable of digging one giant tunnel that could hold both sets of rails and the stations. 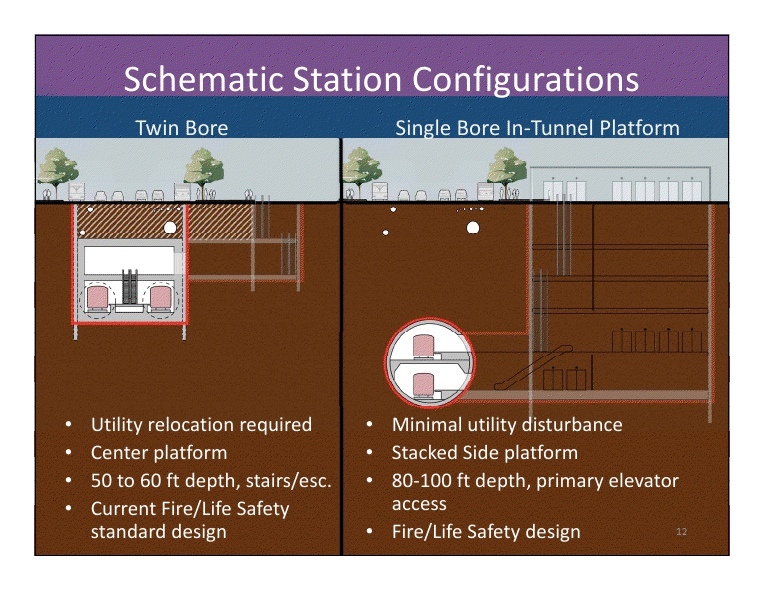 And if the machine can do so by going deeper underground, it could also minimize construction disruptions at street level by avoiding the hassle of moving utility infrastructure and having to dig 6oo- to 900-foot long stations from the top down. The slides above and to the right are from a power point presentation made to the committee. The single-bore machines are being used to expand Barcelona’s subway system, but they are still relatively new on the scene and questions remain. Will more land be needed to build station entrances? How are you going to move all those people up and down from the deeper stations? And can the machines be used in the various soil conditions of L.A. County? But this is certainly an issue to watch as the planning process continues to unfold and the Westside Subway Extension and Downtown Regional Connector move toward construction, which could happen within the next two to three years.